Refastening the 1960 Cruisers Seafarer bottom has launched in earnest. 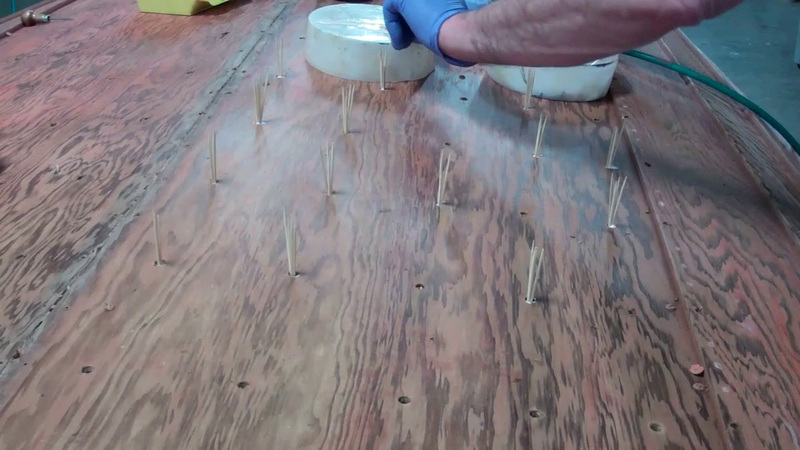 Here I share the how and why of filling fastener holes with hardwood (maple) toothpicks and glue. Doing so gives us fresh wood into which we will drill pilot holes and new countersinks. Not doing so risks having screws spin out, or worse, never bite into the wood. Tomorrow I will use a Japanese cabinet maker’s saw and trim off the protruding material flush to the surface. We will also replace the original #8 x 3/4” silicon bronze screws with #8 x 1”. Given that the sheathing is half-inch thick, the longer screw will be driven about 5/8” into the ribs thereby assuring stronger fastening. Next PostNext 1957 23′ Old Style Lyman Runabout Foredeck Off!